Charleville tragedy mother: "At the end of the day, he didn't know what he was doing"
The boys’ mother Helen O’Driscoll has said the family is devastated – and called on anyone with mental health problems to seek help. HELEN O’DRISCOLL – THE mother of the three brothers who died in last September’s Charleville tragedy – has issued a heartfelt plea for anyone with mental health difficulties to seek help. 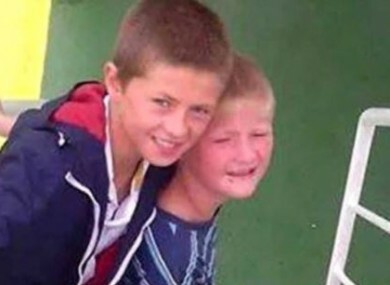 Twin nine-year-old boys Paddy and Thomas O’Driscoll sustained more than 40 stab wounds each, inflicted by their 21-year-old brother Jonathan who took his life less than an hour later. At an inquest yesterday, a jury returned open verdicts in relation to the two young boys. It found Jonathan had taken his own life. In the days before the attack, Jonathan conducted a number of online searches that gave gardaí an indication of his ‘state of mind,’ a senior detective told the inquest. The jury also heard how doctors became concerned for Jonathan’s mental health, and that he was prescribed anti-depressant and anti-psychotic medication. However, a postmortem revealed no evidence of medication in his system. “Like many young men he stopped taking the medication and became unwell again prior to his death,” consultant psychologist Dr Robert Burns said. “I was his mother. I rared him for 21 -and-a-half years of his life, God bless him. She urged mothers and fathers to listen to their children if they spoke about mental health difficulties, and said parents should seek medical help if they were approached about a particular problem. Jonathan was fostered by Thomas and Helen O’Driscoll, and later adopted by the couple. I got the phonecall the day he was born to say that I was the proud mother of a lovely baby boy. She had been waiting for years to have children at that stage, she said. Jonathan’s mental health declined after a car accident in 2012. His search for his his birth family also added to the stress he was under, his mother said this morning. The open verdicts recorded in the deaths of Paddy and Thomas “meant an awful lot” to her, she said. Email “Charleville tragedy mother: "At the end of the day, he didn't know what he was doing"”. Feedback on “Charleville tragedy mother: "At the end of the day, he didn't know what he was doing"”.